These days, if we’re running a business, providing services or content to anybody, we’re probably out there engaging with people in some way – whether it’s through Facebook, Instagram, YouTube, or whatever. And maybe we have an engaged audience, maybe people are following us and we’re successful. So the question then becomes, how do we sustain this at scale? I mean, this is definitely a big challenge to solve. And, I think it is the first challenge to solve. What content or what offering do we have to share with the world? One of the biggest challenges or obstacles can be that people try to think about money and all that before they figure out their offering – what they can actually give to people. And more so than any other time, I think that’s an important thing to answer because pretty much anybody and everybody can be producing content. Because of this, there’s a lot of competition – there’s a lot of noise. But in the same way, there’s actually opportunity because of this fact. The thing is, if you are creating content and you have something of value, there’s always going to be an audience that’s ready to engage with you. So, the question becomes, once you get to the point where you have solved that problem of what you’re offering, how do you maintain that in terms of supporting yourself financially? Because it requires a lot of effort to do these productions and create all your content. We need to find ways to financially support ourselves. It’s not going to help us or our audience if we come to a point where things are out of balance in that area. Membership sites are a great answer to this question of, how do I sustainably build and maintain a content business? It has a lot to do with engagement. The thing about connecting with people on social media, getting likes and things like that – which is all very good and helps to build credibility – is that it builds a wide audience of people. But at some point, that relationship needs to switch to something more intimate, something with an agreement. This is something that the people who consume your content will appreciate just as much as you will. From there, it comes down to you instructing them on how you want them to engage with you. This is where the membership site comes in. Because with a membership site, people are going into a more intimate setting with you. They’re coming into your home. This could even start with a free membership level. So, the free membership level, it’s a subtle distinction, but it’s very powerful. When someone comes into your site, they’re actually taking a specific action to be a part of your community. They’re logging in, they’re inside of your walls. Not the YouTube walls, not the Instagram walls, so there’s a different feeling. The advantage here is that you can control this experience. It becomes more about your personality. How do you like things to look? How do you like to present things to people? One of the keys things about people now being a part of your free membership is that it’s somewhere where you have many opportunities available to you about to how to grow this relationship and have a conversation with your audience. Each one of these opportunities happens over the course of the lifespan of your business. This isn’t something that you set up from day one. What happens when you have a membership site is that you make it a possibility to ultimately be able to do these things. And one of the first things you might consider doing – especially if you’re creating content – is creating paid content, right? Let’s say that you have a course that you’re selling. If people are only engaging with you on YouTube or Instagram (or some other social media platform), they have no way – without a certain number of extra steps – to easily purchase something from you. But, if they’re coming and engaging with you on your membership site, now it’s really easy. They click a button and can purchase your course or other paid content right on your site. Or, if they’ve purchased something from you in the past, they can click a button (using the card on file), and buy it with one click. The other advantage of people being in a membership site – especially one powered by MemberMouse – is that there’s this tool called SmartTags. SmartTags allow you to have a dynamic conversation with your customers and members, based on what they’ve done (or haven’t done) on your site in the past. By having somebody inside the walls of your membership site, you now have the opportunity for personalization. You have an opportunity to evolve the conversation you’re having with these people. This can be done in a direct way, because now you can engage with them based on specific actions they’ve taken on your site. We’re already doing this thing that membership sites make so easy. We’re already trying to educate and segment our audience when we put content in front of them. But it’s a little bit clunky because we have to communicate who the message is for and your audience has to make the decision on their own. Whereas in a membership site, they don’t. It’s all going to be invisible to your members because the decisions are being made through the power of the tool that’s powering your membership site, not through any sort of up-front messaging that you have to give to them. This is one of the main benefits of a membership site. 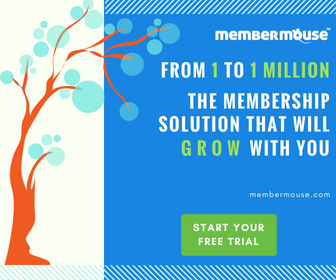 A membership site is a personal platform from which you can grow your business in the way that works for you, in the way that works for your audience, and you have 100% control over it. If you’re somebody who has had success with creating content, you’ve gotten that momentum going, you know your content calendar, you’ve got your production down, then it might be time for you to consider a membership site so that you can start building a more dynamic relationship with the people who follow you. And the thing is – speaking for myself – the people who I follow on different networks, I appreciate what they do and I am actively looking for opportunities to support them. And what that comes down to is that person providing me with that opportunity to give something back to them. So many of people that I follow don’t have a way set up to monetize their content. It seems imbalanced. I want to support them and I’m sure there are other people like me. Yes, there are certain types of people who just appreciate the free content and they always want to stay at that level. But for people like me who are ready to take action and get somewhere, I’m willing to make an exchange with somebody, to have a more intimate relationship with a person and get access to more specific training. The other thing about a membership site is that it’s going to be a smaller group. This means that whoever is producing the content can have a more specific conversation with those people because you know more about them. This is going to have an exponential effect in terms of growth because you’re going to be more specific with what content you’re creating. You’ll be able to afford to do that for a smaller audience, because that audience is going to be giving something back to you in exchange for that more specific conversation. And now that you’re producing content for a smaller audience, you’ll actually find that there are more people out there like that. Once you’ve gained momentum and people have gotten benefit from your offerings, they’re going to share it with other people like them. Now they all have a place to go where they can sign up and become a member of your community. Now you may say, “Well, if I create a membership site, that’s going to be more work, right? That’ll be a new tool for me to learn and maintain.” And yes, that’s true. But the thing is, if you think back to a point before you built the thing that you have now with the content creation and everything, whatever you’re doing, or even if you haven’t started yet, you can still think of something where you were at square one, right? And there’s always these daunting aspects of starting something new, there’s always stuff to learn. And it’s no different with a membership site. But it’s good in addition to understanding the challenges involved, to also keep in mind the benefits. And the key benefit to the membership site is that you are building a platform from which you can create a sustainable business. Something that’s going to provide income to you and something that’s going to support you in providing more content to the audience that wants to hear from you. It’s great to have content and an audience that engages with it, but if we don’t find ways to monetize that to a point where it can support us to continue to do it, then we can end up in situations where we’re doing something that’s imbalanced. Where we’re giving more than we’re receiving. And that’s not sustainable, right? So, the thing about a membership site is yes, it will take some work, but it’s going to be something that has a lot of legs to it. I mean, we’ve been running our membership site for 10 years now, and there’s always more ways that it can be improved and fine-tuned. Those things don’t need to be thought about on day one. A membership site can be started minimally. You don’t need to do the things that people who have been doing it for five years are doing, right from the beginning. A lot of times, I find that the reasons that people get overwhelmed is because they’re thinking about having to do those types of things. For example, a big one is website design. I think a lot of people think that if they’re going to put a website up, they have to put a lot of effort into how it looks and feels. And it’s true that things need to be intuitive and they need to make sense. But, in terms of how the website looks visually, the design isn’t so important to the success of the project – especially if you’re focusing most of your attention on building a relationship. People are there for you. They’re not there for how your site looks. And ultimately, the thing that makes a membership site successful or not is not how it looks, it’s the product or service that you’re providing to people. So, this is the number one thing to focus on up front. Keeping that in mind, getting something up could be done in as little as a number of hours, right? You can get it up in a number of hours and you can work on it for a number of years. The key thing to keep in mind is not to get prematurely overwhelmed by thinking about the things that are coming down the road, on day one. Because they don’t have to be done on day one. So that’s important to remember. Not sure if you're ready to start a membership site? If you're not quite ready to start a membership site, check out this list of 10 alternative steps you can take right now to test your concept and gain momentum.